Academics have rejected a 13.1% pay rise proposal amid warnings that an exam-marking boycott could intensify into strike action. Lecturers' union Natfhe called the three-year offer "miserly", while the Association of University Teachers said it was "disappointing". Employers said they were "incredibly disappointed" at the rejection. Unions want a rise of 23% over three years. The marking boycott threatens to disrupt thousands of graduations. The Universities and Colleges Employers' Association (Ucea) increased its offer of 12.6% over three years to 13.1% earlier this month. But head of universities at Natfhe, Roger Kline, said: "If the employers leave us no alternative, further action could include strike action and a toughening of other sanctions." He added: "This dispute could seriously worsen if employers do not take account of the mood of lecturers who have seen promise after promise to improve their pay broken - even despite the billions of pounds of new money entering higher education this year." The AUT and Natfhe are refusing to mark exams or coursework. The AUT is also boycotting the setting of exam papers. It said the revised offer did "not properly take into account the extra money coming into the sector" from 2008, when students in all three years will be paying the "top-up" fees to be introduced from this autumn. General secretary Sally Hunt said: "We are disappointed that things have failed to move on enough, especially considering the employers' words about the possibility of a settlement last week." Ucea claimed its offer had been accepted by unions representing support staff such as cleaners and porters. Chief executive Jocelyn Prudence said: "We have responded constructively to every request they have made in the course of talks and negotiations over the last weeks and months, but each time we do so they move the goal posts." Higher Education Minister Bill Rammell said: "I would urge the unions to put this offer to their membership as quickly as possible, and to suspend their actions which are affecting students." 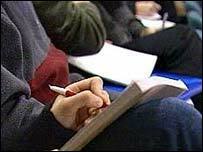 Around 300,000 undergraduates are taking their final exams.